Convertibles? Whatever. Ultrabooks? Idgaf. 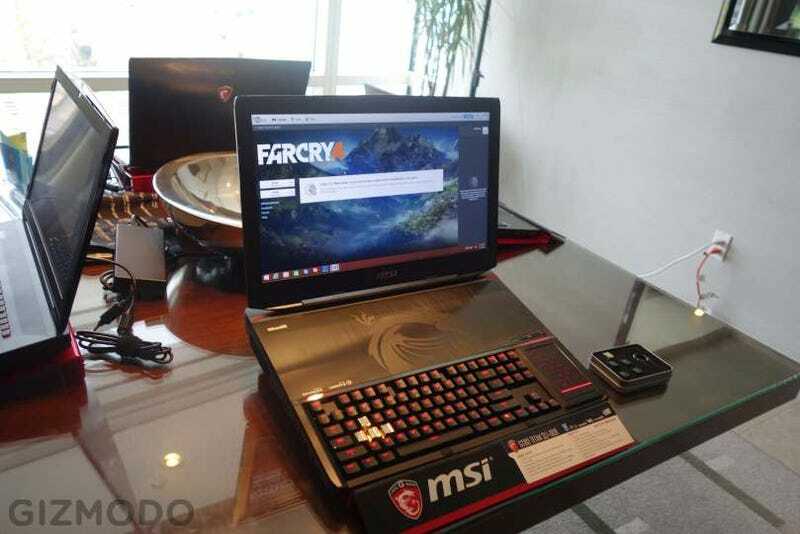 A damn huge laptop with a mechanical keyboard built right in? Now we're getting somewhere. MSI teased its new mechanical keyboard-toting GT80 Titan earlier this year, but I just saw it in the flesh and my god this thing is the work of madmen in the best possible way. What you see here is a full-on mechanical keyboard complete with Cherry MX Brown switches and swappable keys. MSI is packing in a set of metal WASD keys that would give any PC gaming geek an premature nerdgasm. Pretty much as soon as I saw it, a part of me started to squee, and once I got my hands on those keys I fell in love. It should go without saying, but it feels terrific to type on. Even if big mechanical keys on a laptop body feels just a little uncanny at first. That weird-looking setup where the keyboard is shoved all the way to the front? It's for a good reason. Two of them actually. First is to make typing on this as similar as possible to typing on an external mechanical keyboard; you don't have a level expanse of metal jutting out from the bottom your desktop keyboard, do you? Sure it looks kind of silly but it makes immediate sense the second you try to type on it; the whole thing clickity-clacks like a dream. That touchscreen numpad to the right also doubles as a standard touchpad. As for those guts, the GT80 Titan comes kitted out something fierce. We're talking an Intel Core i7 processor, two 128GB SSDs plus a 1TB hard drive, and dual Nvidia GTX980Ms to power graphics on the 18.4-inch 1920 x 1080p screen. I didn't get to spend much time putting the GT80 through its paces, but the ludicrious specs pretty much speak for themselves; this thing can blast through just about anything you can throw at it. You pay for all that horsepower though, in a couple of ways. First off the GT80 Titan is thick. Like, really thick. And it's heavy too. This isn't something you throw in a backpack (it is 18.4-inches after all); it's more something that you can move from room to room if you really need to. Or something to make LAN parties just slightly easier. The second way you'll pay is the price. The initial version of the GT80 Titan has a price of $3,600. MSI says they'll put out different versions with different specs that might be a little more affordable, but the GT80 Titan is probably never going to be anywhere within even a couple of miles of "cheap." But even though you'll probably never buy one—and maybe don't even want something this absurd—we can all appreciate the fact that something this delightfully absurd really exists.